So these are like dorians, right? Apparently, I don't know jackfruit. Fortunately, this website seems to know the difference, and if you're really all that interested, take a read, this post will still be here when you come back. Good to know I'm not the only one who didn't know until my more botanically aware spouse shot me the stinkeye. They're pretty similar in appearance, and I remember holding a durian at a 99 Ranch out in California once - heavy, spiky sucker, looked to be more of a projectile load for a trebuchet than something that was actually somewhat edible. So while durians and jackfruits are not the same, it's the image I'll hold in my mind, and if it's not completely accurate, then blame my blissful 'merican ignorance. 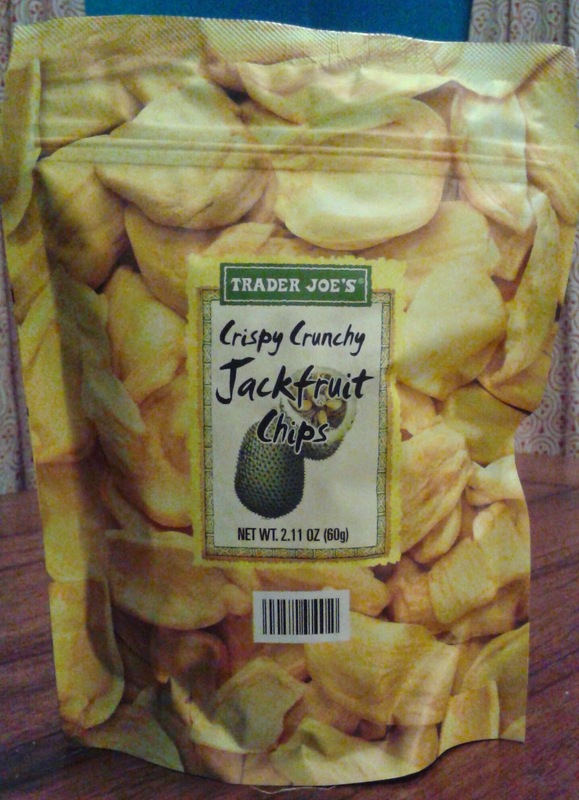 As for these actual Trader Joe's Crispy Crunchy Jackfruit Chips....mehhhh. I've had a couple handfuls of them by now, and can't quite make up my mind. Sandy's in the same boat. They're just kinda there and otherwise not horrible but not all that great either. It's not the texture's fault - think dehydrated apples but not quite as sticky-dry with a little more girth and fluffier Styrofoam aspect, and it's about like that. It's not bad for a dried fruit snack (though dried banana chips are still my all time fave). Crispy and crunchy are adequate enough adjectives, not much more needs to be said there. Really, it's more the taste. Or the lack thereof. Depends on who you ask. Sandy insists the chips taste like nothing. I don't think that's entirely true - there's a subtly sweet flavor, kinda lightly citrus-y and banana-y, which is fine enough until it morphs into some sort of bittersweet funk that grabs hold of the back of your tongue like a toddler in need of consolation. It just won't let go...it's there and it's there to stay, no matter what you do. Seriously, I ate one ten minutes ago, and I can still taste it swimming around in my saliva. Not a fan. Yet there's something about these fruity chips that I feel like I should like - perhaps because they're fruit so they make a healthy snack and are a possible replacement for chips and Cheetos and the like. Could be true. But still, I'd much prefer just eating a regular ol' apple for a crispy crunchy snack on the go, and if I have the luxury of some cashew butter around to spread on a slice, even better. These just don't cut it for me. Sandy debated her score a long time before settling on a two, standing by her "they taste like nothing" claims. A two sounds more than fair to me. I Wish I had held this off until I read your review. I got it the instant I saw it last week and was so disappointed I actually wondered if I should return it and if they'd be a good sport about it. They tasted like banana chips, I expected more jackfruit flavor rather than the savory plantain flavor. We used to have jackfruit chips in my grandparents' house in India. But they were made fresh from the jackfruit that grows on their trees. Also sprinkled with lots of spices that gave them quite the kick. Delicious. I might have bought a bag of these out of pure nostalgia. Will refrain. Thanks for the link to our silly durian site! Trader Joe's is one of the few things I miss about living in the USA :) Maybe some day they'll offer crispy durian chips as well! I just had a bag of these while visiting in CA and they are delicious!!! Wish I could find them where I live on the east coast. I HIGHLY recommend them. I am NOT a fan of banana chips and disagree that these taste like those, or like Styrofoam for that matter.